The Boston Celtics beat the Atlanta Hawks 110-99 on Saturday, making it their 15th straight win. It was another comeback victory for the Cs, who were down by 15 points at the end of the first quarter. They finished the half strong by outscoring the Hawks 24-15 in the second quarter, and were found down by six points at the end half. Kyrie shot 100% from everywhere on the floor in the second half, and finished with a game-high 30 points, 5 assists, and 4 rebounds. And this was all with the mask on! And it's not like he took a bunch of wide open shots. He was in typical Kyrie form, driving to the hole, drawing contact, and making pretty looking baskets. It's not the first time that we've seen Kyrie come alive in the fourth quarter. 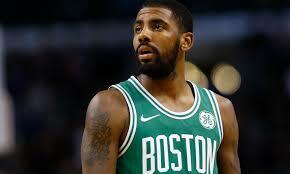 Just last week in the Celtics' monumental victory against the Golden State Warriors, Kyrie heroically took the mask off and scored 11 points to end the game. Remember back in October when the Cs faced the Miami Heat? Kyrie scored nine of his 24 points in the game's final two minutes. To no one's surprise, he's been one of the more clutch players in the NBA this season. It's no wonder why he's been included in much of this season's MVP conversation, as he's averaging 21 points, 5.2 assists, 3.2 rebounds, and 1.7 steals this season.